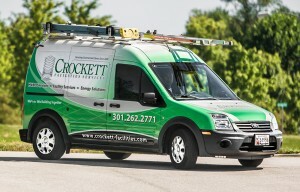 Crockett Facilities Services, Inc., headquartered in Bowie, Maryland, is mechanical contractor providing integrated facilities services, heating, ventilation, and cooling (HVAC) repair and installation services, HVAC preventive maintenance services, data center cooling services and energy management services. We help commercial real estate property managers, building owners, government agencies and data center IT managers to operate their HVAC and mechanical equipment efficiently and keep tenants comfortable. As a GSA-approved contractor and a woman-owned business, we service government clients with on-site facilities management throughout Washington, DC and Maryland, Virginia, Pennsylvania, New Hampshire, Florida, Georgia and South Carolina. We also provide mobile HAVC service and emergency 24/7 response, serving commercial and government clients in Washington, DC, Maryland, and Virginia. To request a cost quote or to request a service call for facilities maintenance or heating and air conditioning services, please complete our online form, call or email us. Schedule a service call or get a quote for HVAC service. Call 202.600.2787, email mford@crockett-facilities.com or complete our online form.